If there’s one sound I have a truly tuned ear for, it’s the pulse of a Mazda rotary; there’s just nothing else quite like it. As many readers might know, my home country of New Zealand is a wankel enthusiast’s mecca and I have grown up with the idle of ported rotary engines ringing in my ears. Having left NZ six months ago now, I’ve come to truly miss that sound, as it quickly became clear that us Kiwis are nearly alone in our Mazda rotary obsession. While in England recently attending the annual Players Show at North Weald Airfield, that familiar rhythmic pulse was the last thing I expected to hear, but there it was, ebbing towards me as soon as I opened the door of my rental car. Like the smell of an ex’s perfume or a particular song from your teenage years, the brap brap brap sound instantly brought back memories for me: the traditional Kiwi summer spent cruising the beach spots as RX-2s, RX-3s, RX-7s and all the rest rolled past. Hearing this sound in the middle of an airfield in the UK, with a biting blustery wind cutting right through my jumper, I felt nostalgic – patriotic even – and I had to know more. The faint pulse had disappeared before I’d even finished getting my camera gear out, and with only a rough direction in which to start hunting, I began my search for the elusive Mazda. As you’ve no doubt already guessed by looking at these images, it would turn out that I was looking for entirely the wrong car. What exactly was I looking at and why? More information was needed, and I eventually found the owner, Pipey McGraw, who was able to fill me in on the details. 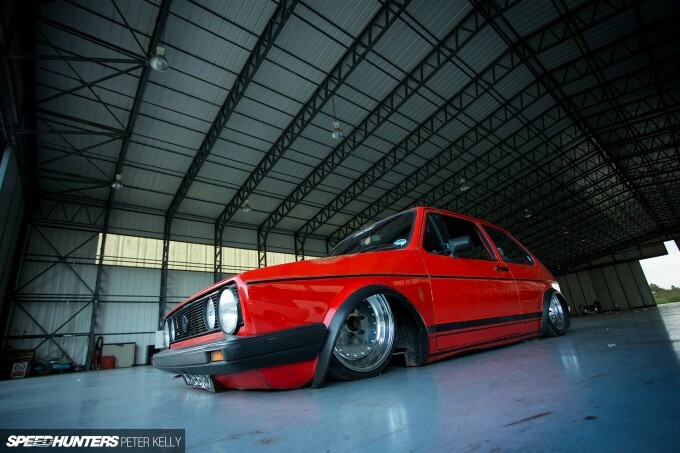 It turns out this is really only partially a Golf. In truth, it’s probably more of a 1970 VW Beetle, though it’s registered as an ‘SMT ULC’. It’s also completely street legal. 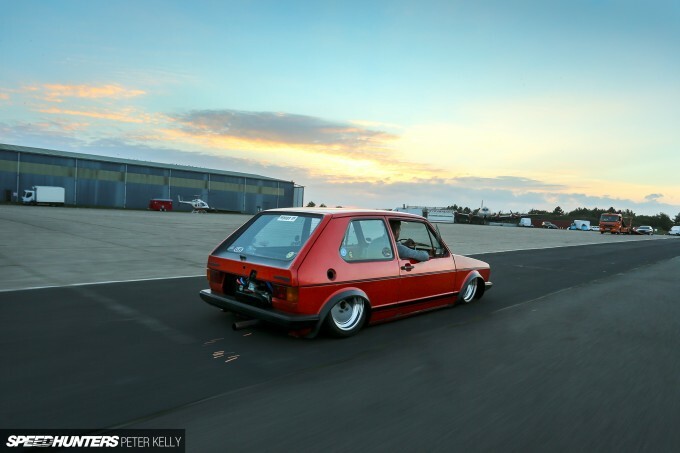 Pipey kicked off his project back in early 2012 after finding this GTI body, which had had the bottom cut out and placed over the top of a scrap Beetle pan with a few tack welds to hold it in place. What he first thought would be a quick weekend fix-up for a laugh has turned into a life-consuming labour of love for the Bournemouth local and his mates. Besides the Golf shell itself, nothing else now remains from the project he originally purchased. The first Beetle chassis was scrapped and replaced with a nearly all-new pan, which uses a spine from a 1970 Beetle and brand new floor pans, front frame head panel and rear spring plates. 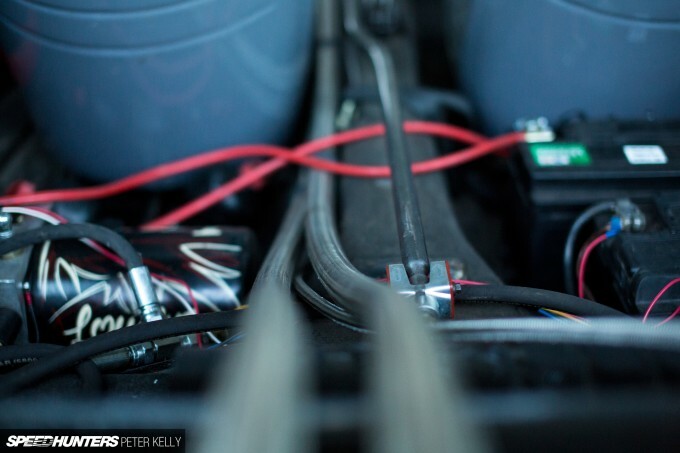 British MOT rules dictate that the floor pan of a car cannot be modified, so all the work went into the body, fabricating strengthened mounting points that aligned with the Beetle’s stock points. Pipey also used the opportunity to sit the mounts up higher, resulting in a 4-inch body drop. 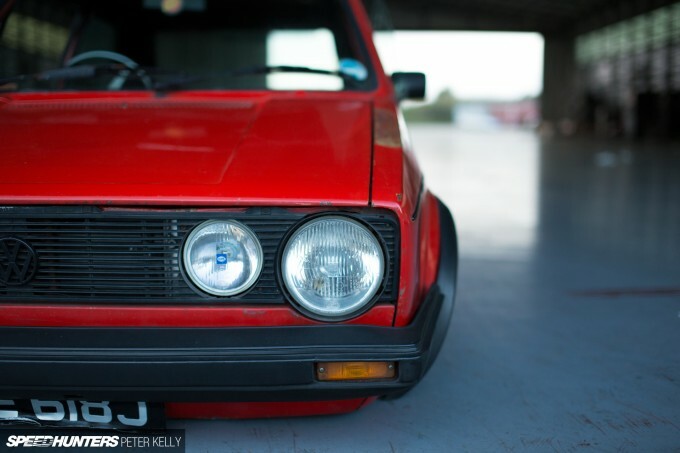 This allows the GTI portion of the car to sit extremely low to the ground while the Beetle chassis remains at a more reasonable height, which also allows the car to retain some reasonable suspension geometry. Although the body itself is clearly a little beaten up, that’s exactly how Pipey wanted it. He says that although he appreciates all the work that goes into immaculate show builds, it just isn’t him – there’s something to be said for battle scars and character. Although nothing has been repaired as such, originally this body looked like it had been sitting in the sun for 30 years; it had turned shades of pink and white, and was completely rough to the touch. Pipey spent countless hours sanding back the tired paint and polishing it up, resulting in a strange high-sheen, yet ratty look. 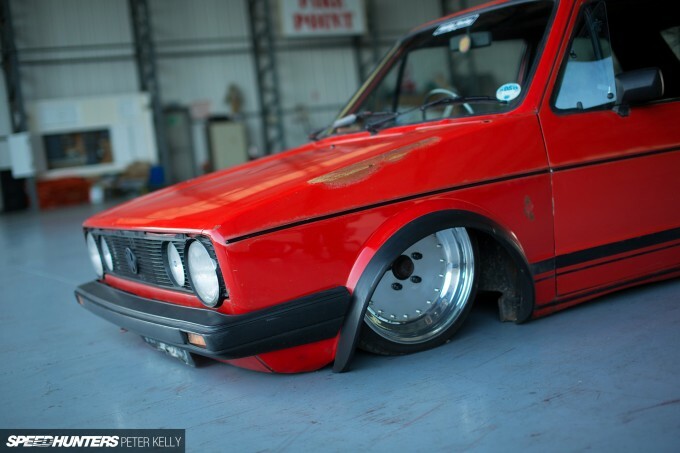 Another Beetle has been raided for its bulkhead, which was then welded into the Golf body. 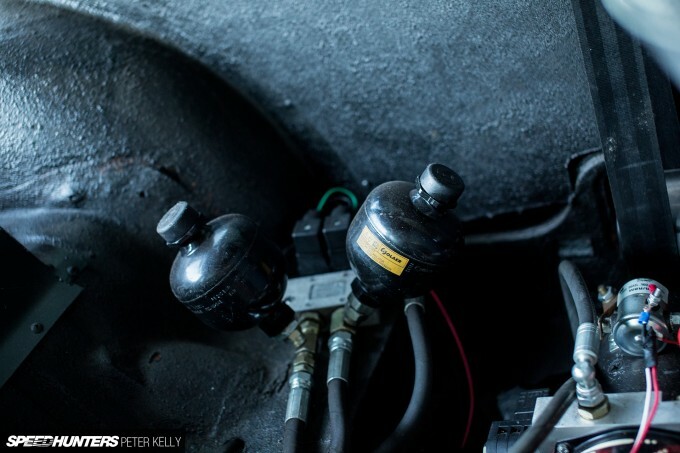 In a rush to get the VW done for the summer of 2013, the car ran a stock Beetle air-cooled flat four that Pipey had lying around behind that bulkhead. The car travelled so well, performing faultlessly on big trips to the huge RadikalBugz and European Bug In meets in Belgium, that Pipey decided to stick with the motor for the rest of the year. As you can now see though, he soon grew bored: Pipey needed something with more power. Although the easy option would have been to build a monster VW mill, it wasn’t going to be weird and different enough for Pipey. It was time to look farther abroad. 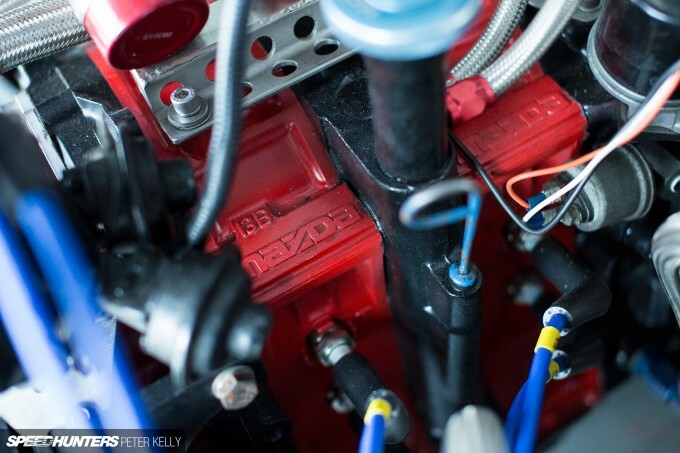 With only very limited space available, Pipey needed a motor that would be small enough to fit, yet still provide a big upgrade in power over the stock flat four (that’s not really the hardest of asks, mind you). 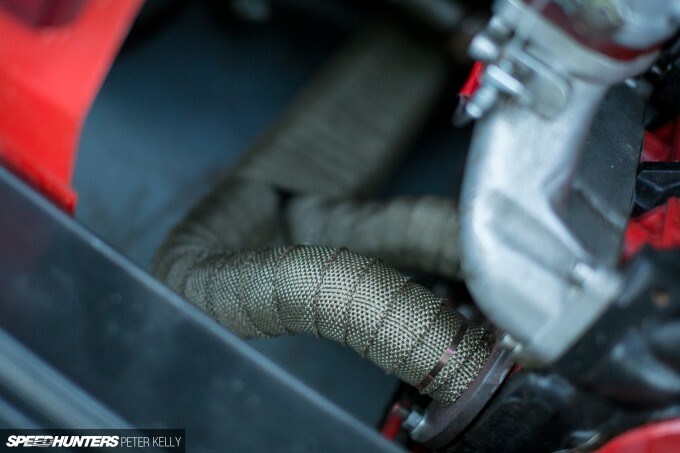 Plenty of time was spent researching the matter, but eventually it was the countless videos of angry rotary-powered machines pulsing away that can be found online, and a subsequent search that turned up off the shelf Mazda-to-VW gearbox adapters, that convinced Pipey to go with a Hiroshima screamer. This was found in the form of an early twin-rotor 1300cc 13B, originally from a Series 3 RX-7. Upon trial fitting the rotary, it quickly became clear that the sump of the Mazda motor hung a good couple of inches lower than the VW engine’s, and with the car being so low, it was genuine cause for concern. Pipey and friends fabricated new mounts for the 4-speed VW Type 2 Transporter gearbox that had been adapted to the motor, and then cut into the bulkhead to allow the box and motor to sit two inches higher. Finally, after plenty more hours spent sorting out the wiring and cooling and with a summer full of events fast approaching, it was time to start the Mazda-powered VW up. Unfortunately, the ‘great running engine’ Pipey had purchased turned out to be a complete dud, and not long after it was fired up for the first time, it dropped a rotor and fell to pieces. With only two weeks until the 2013 Retro Rides Gathering in Worcester, Pipey now had himself a dead duck, and spirits were low – but it wouldn’t last. Help came from Carl and the team at Hayward Rotary in Berkshire, who dropped everything to get the motor apart and not just fixed up, but transformed into a monster. The block has now been fully bridgeported and runs high-compression Series 5 RX-7 rotors with Hayward’s own highly-regarded apex seals. 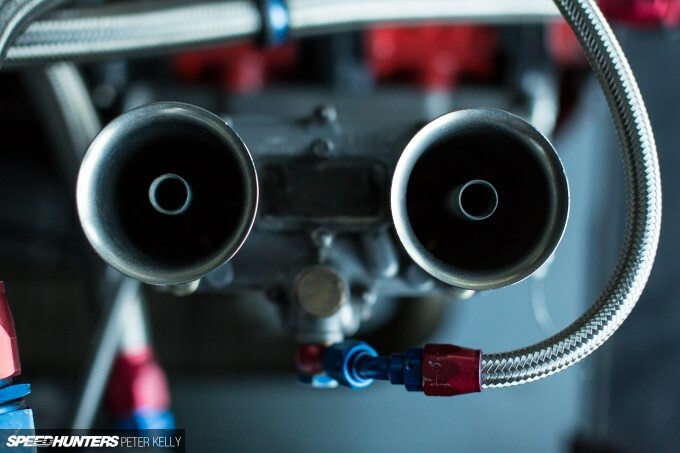 Rotary engine porting, for those who may not have had much to do with these motors in the past, involves enlarging the intake and exhaust ports to allow more air and fuel into and out of the engine, similar in concept to porting/polishing the head and fitting a more aggressive camshaft/s into a piston motor. The ‘bridgeport’ specifically refers to a process of not only enlarging the standard port, but creating a second thin port just above it, almost like an eyebrow to an eye. The bridge that is left between the two ports ensures that the corner seals of the rotor don’t fall out and make mincemeat of the motor. 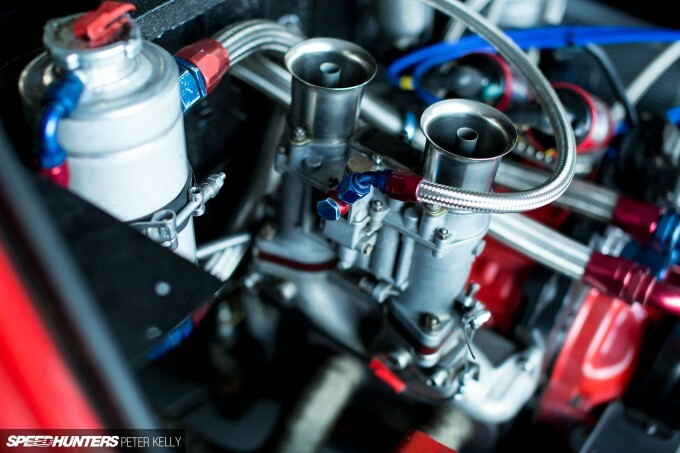 The engine now pulls air and fuel through a 46mm Weber IDA carb, which is bolted to a port-matched Racing Beat manifold and was originally pulled off a Porsche 914 race car. 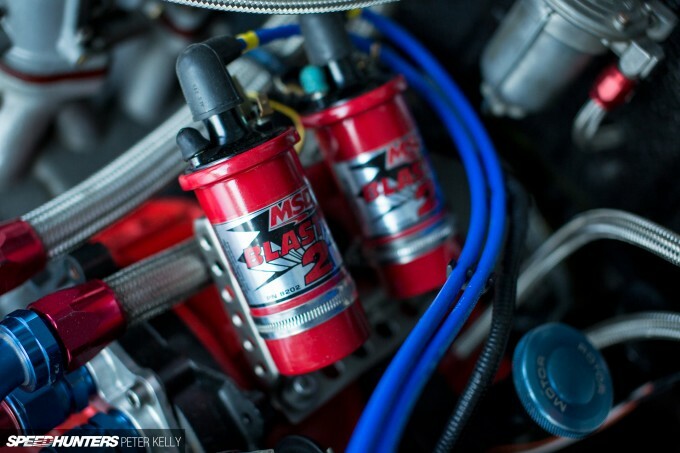 Spark is provided to RX-8 plugs by a pair of MSD Blaster coils via big Magnacor leads. Big braided water lines can be seen running from the rear of the car to the front, where a radiator is located between the two enlarged wheel tubs. 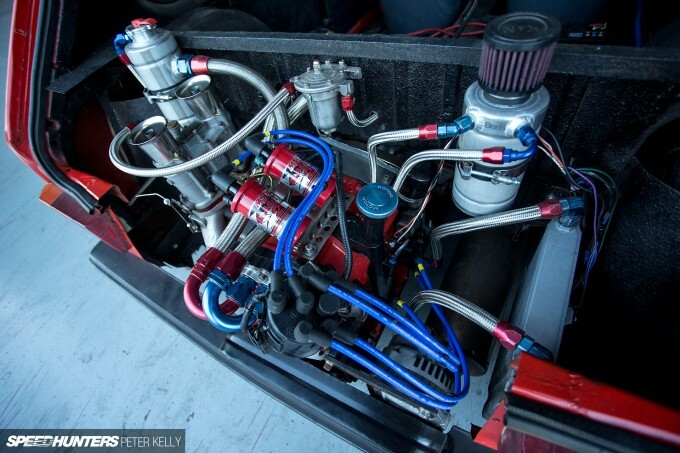 Though the motor hasn’t been dyno tested, wisdom states that it should be making somewhere around the 250hp at the flywheel mark – a good five times more than the stock air-cooled flat four that was in the car previously. Though the big hike in power was great, it made the car scary to drive on its current static suspension set up. It was time to make this machine a little more practical. Sure, Pipey had already been driving this car around for a good year crazy-low on static suspension, but for the sake of practicality he decided to acquire a Rayvern hydraulic suspension set up, which has been designed specifically for the Bug platform. 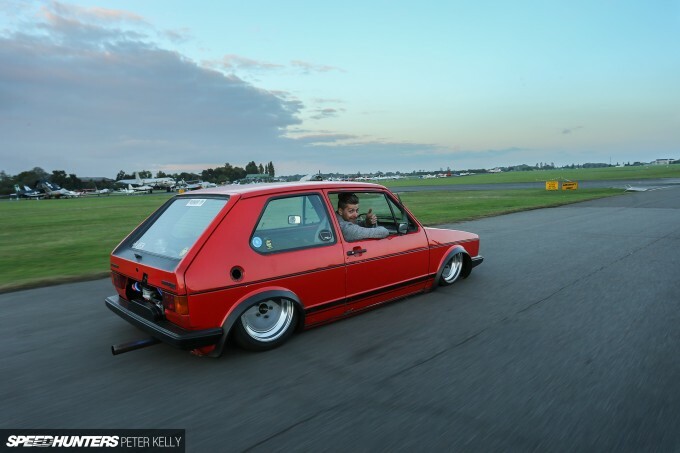 He admits that it’s the one big thing he doesn’t like about the car, but at some point, you’ve got to be realistic about practicality, and nothing screams practical like being able to lift your car and drive without being followed by fireworks as your panels go toe-to-toe with the road surface. The set up runs hydraulic rams with inline shock absorbers and adjustable rear spring plates. The front beam has also been narrowed considerably, which Pipey carried out firstly because it’s a traditional aircooled Bug modification, and because it also allows the front wheels to achieve full lock. The two-piece drag-style wheels measure 16×6 inches and were made to Pipey’s specifications in California by Custom Metal Spinning, before being sent over to the UK. In this image you can see just how far inside the fenders the front wheels sit. Like the rest of the VW, the interior has a very rat-bug feel about it and is pieced together from various bits and bobs. With that said, Pipey says that he wouldn’t mind going for a more complete interior some time in the near future. 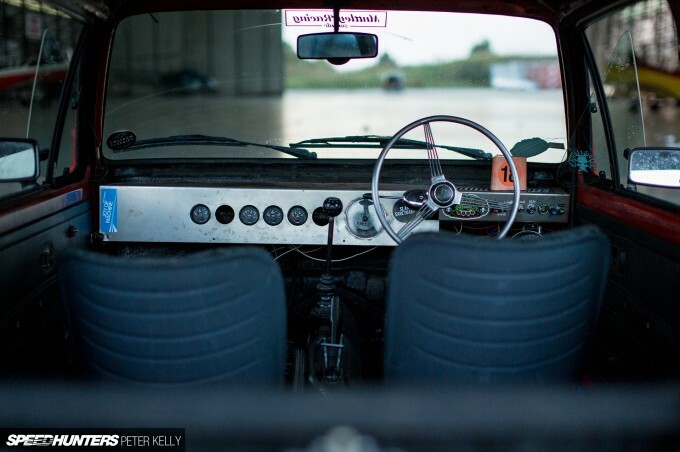 For now though, the bead-rolled dash is about as simple as it gets and houses an array of gauges from an Audi 80. 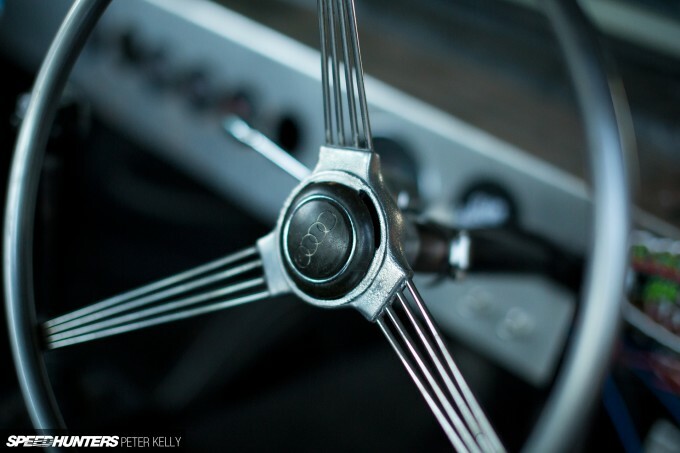 The steering wheel has been custom made by Coltech Classics, using a variety of bits and pieces from vintage euros. 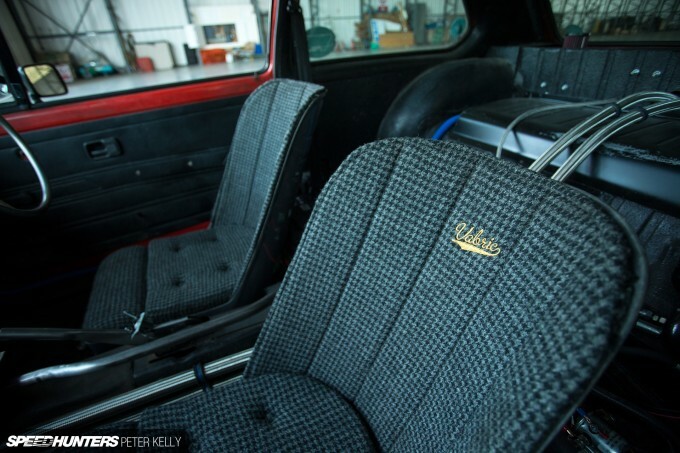 These awesome Vabric tweed-trimmed bomber seats are by far my favourite addition though, and they suit the style of the build perfectly. 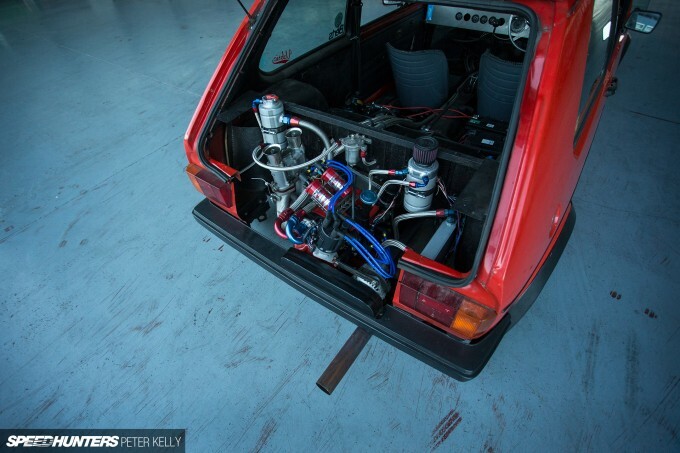 With its sparse Beetle interior, ratty Golf GTI exterior and raucous Mazda engine jutting from its boot, Pipey’s car is what some might call a European hot rod of sorts. It’s made of up so many different vehicles, and is about as far from the stock car – whichever one you choose – as is possible. Considering it’s completely street legal and it has driven all over Europe, we have to wonder how a car like this is received by all the people that pass it by on the roads. 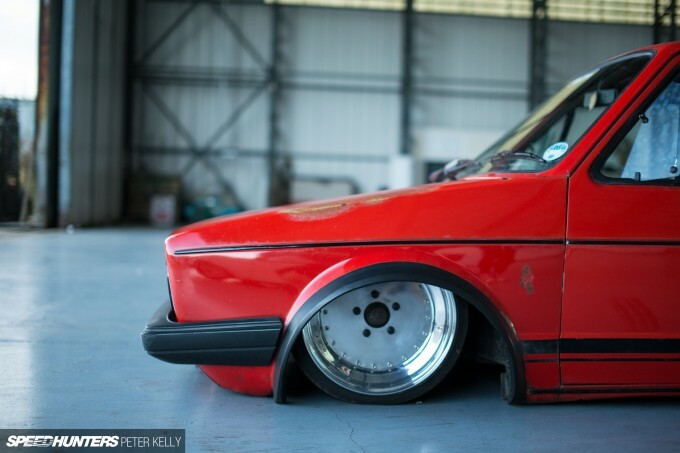 "British MOT rules dictate that the floor pan of a car cannot be modified"
Not heard this before. I know that if the floor pan of a beetle is modified then it will no longer be classed as a beetle and will require an IVA inspection after which it will be given a new registration, but it will still pass an MOT if deemed safe and modified correctly. That was not necessary. It's hideous. I like this one. It serves a purpose. It sets a benchmark. We reached a new low here, literally and metaphorically! I can appreciate this. Something completely different. Any pics of under the front hood? Not my cup of tea, though a very intersting car down to the detail level. Something really different, as stated before by other users! so, there IS a thing called "too low"
Absolutely love this build, unique and charming. All you naysayers waiting for some more Rocket Bunny / Liberty Walk? 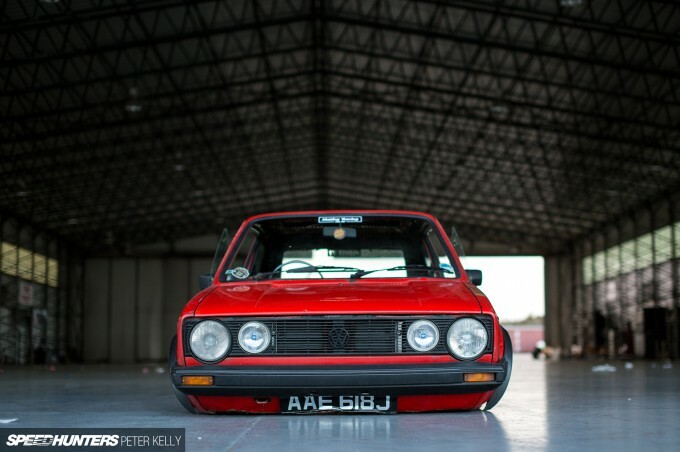 I'm so happy to see this here, Pipey is an absolute gent and his determination to build his own car, his own way is just awesome. He also makes me never complain about my car being 'low'. Great write up, Pedey. You guys are smashing it as of late! I remember seeing this in the flesh at Retro Rides Gathering... 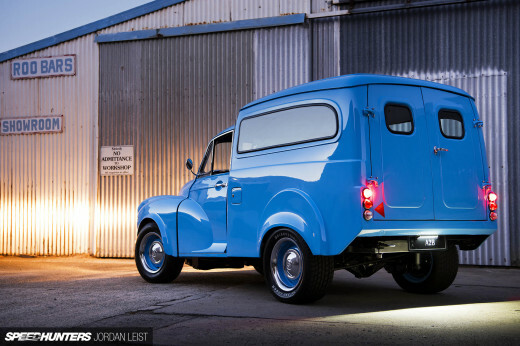 It looked great and I liked the Japanese twist after it was aircooled. However, when he tried starting up it wouldn't play ball, It choked and spluttered like an asthmatic and sounded fuel deprived. When it did eventually start however it sounded even worse. I know some rotaries make incredible noises, not sure what abuse this one's had though. With a decent tune up it'd be an even better machine. need to see this thing alive. where's the video? Here again this is all about doing your thing. People get so bent on how things are "supposed to be" that they forget it isn't theirs. The stance makes it. If it were higher it would miss the mark. The wheels work. They are not typical and that's what keeps this car from being like a lot of other cars. Nice write up. 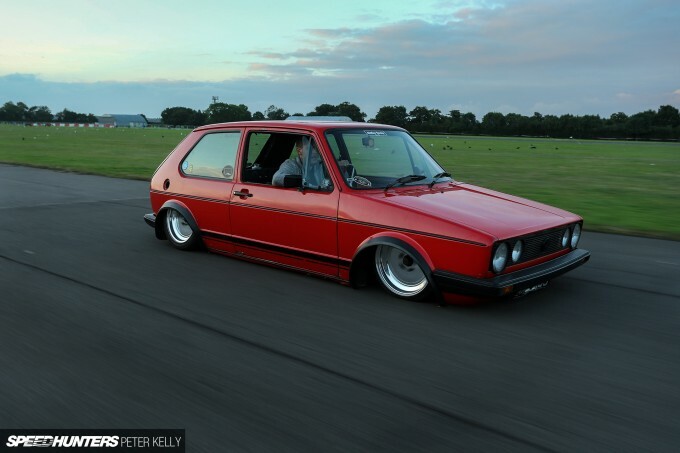 Im not a big fan of the whole stance movement, but this is pretty awesome. 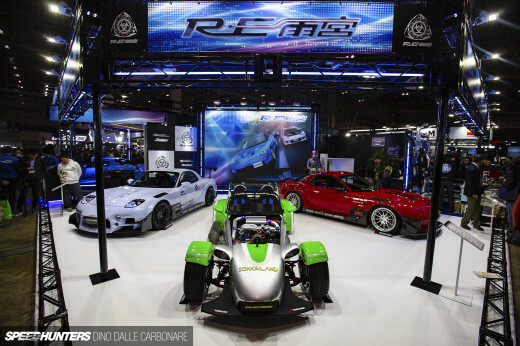 Its such an interesting mashup between the body, chassis and engine. The fact he can go through full steering lock, and even though its absolutely slammed it can retain a pretty mild geometry is impressive. Great engineering. But I must admit this is pretty radical...taking a GTI top weld it to a beetle bottom and power it with a 13B rotary??? Yeah, it's out there way in left field. Great post though. There is absolutely no reason for this car to exist. Yet, it's somehow really cool. I do understand the comments re the beat of a rotary. Having rallied an RX3 many years ago, it was a sound that was close to my heart. On the odd occasion I hear one hear in Oz, I stop and look and wait for it to go past and it always makes me smile. 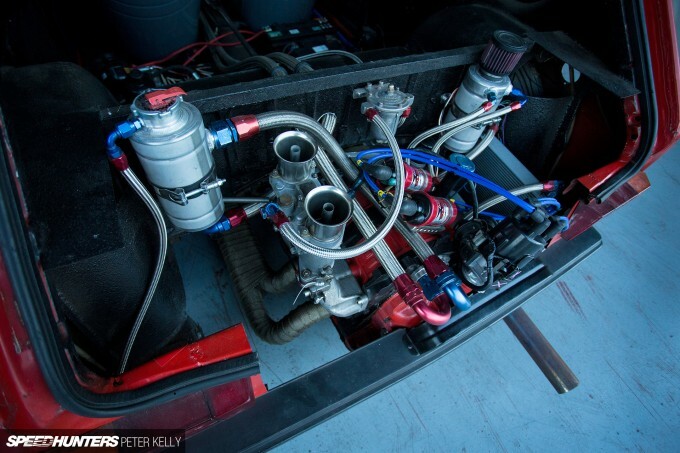 This would be a thousand times more "car-ish" with the rotary sitting in the engine bay. You can still lower it, still has a great sound, but it would be a car. Drivable, etc. '...outside-the-box, unique creation that has served as both a talking point for anyone Pipey meets, and a campfire of sorts.' -nuff said...but i will add something lol. lets not get so jaded we lose the wonderment that people outside of our community obviously have when confronted with such a machiiine. I'm usually a hater on everything that doesn't fit my view of the world, but that thing is so special in it's own way that i don't even have a opinion on what it should look like. That thing is a great project, i love it! And i love those seats! Volkswagens and Rotaries, two of my favourite things Congrats to the owner for building something unique and fun. 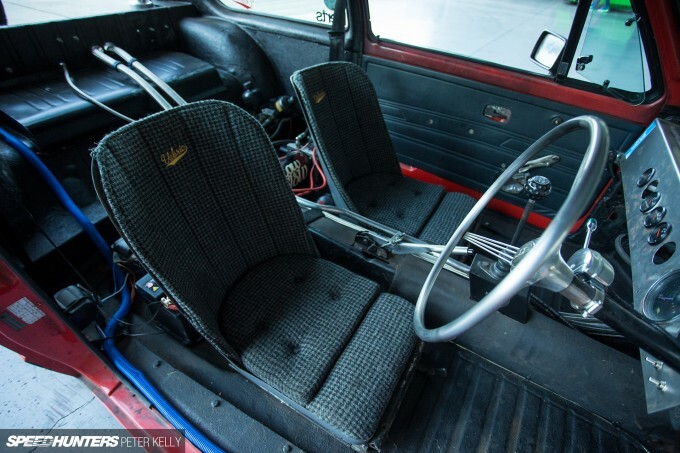 We have a few very cool VW / Rotary hybrids here in Australia you guys should check out, especially the street registered, 20B turbo powered bay window kombi. I like everything about the car, except the wheels and ride height. Give it a decent drop and some meaty tires around a mesh wheel or something, perfect. But it's his car, and I have to admit, it is crazy which was the point. So it's all good, it's what makes the car scene so awesome! oldschoolcat pistol pete 12 It's all good. I really wasn't trying to be bias really. Hate it came out that way. I'm a different than most. I'm not for Euro cars but at the same time I like some of the different things being done. This car isn't practical but nor was it built to be that way. But it does do what it was meant to do, Stir the pot. If he decides to make it garage art then so be it. I liked it because it wasn't typical and it was built for a purpose. Glad you chimed in. Take care. 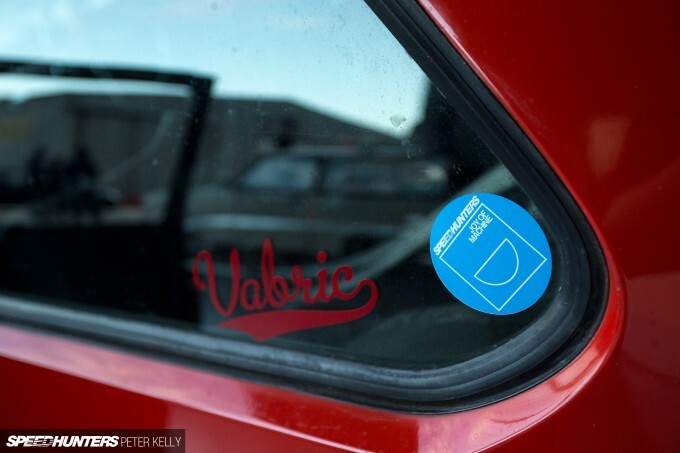 "it quickly became clear that us Kiwis are nearly alone in our Mazda rotary obsession" HUH? Australia, PR to name a couple....you make it sound as if NZ is the only country thats a fan of the rotor. I liked it more before the rotary and that's saying something as I'm a through and through rotor fan. It just doesn't look good having the rear all chopped up to make it "fit". It's good to finally see something non-Rocket Bunny or LB Walk featured though! .....and 13B from an S3 RX7???? Silly veedubs, narrowing your track width? Doesn't an open back or holes in the tailgate area vortex exhaust back into the car? I remembered when I used to listen my neighbor fired up his 13B powered Corolla KE35 with direct exhaust pipe every Sunday morning, that is the best alarm clock ever. Spaghetti this is why I said "nearly" alone. Puerto Rico is definitely one scene I want to visit in the future! @scotty Hi Scotty, 20B turbo Kombi? That sounds awesome, time to try and find it! Thanks for the tip. vroomtothetomb Thanks mate, great point - would have been a nice line for the story. pistol pete 12 oldschoolcat I totally get what you're saying oldschoolcat, it's a fine balance between being unique/having fun and just saying that's what you're doing because you've got no money haha. At the end of the day, it doesn't really matter to me in any case, as long as people are out there enjoying their car and doing what they want with whatever means they have available, then I'm happy. Paddy McGrath Thanks Paddy, appreciate it. Pipey is definitely committed! Peter_Kelly http://www.youtube.com/watch?v=voDPbPT3q6Y This was it a few years ago, I've been told it's putting out a few hundred more hp now. I think he also owns a 13B TT powered type3 notch. 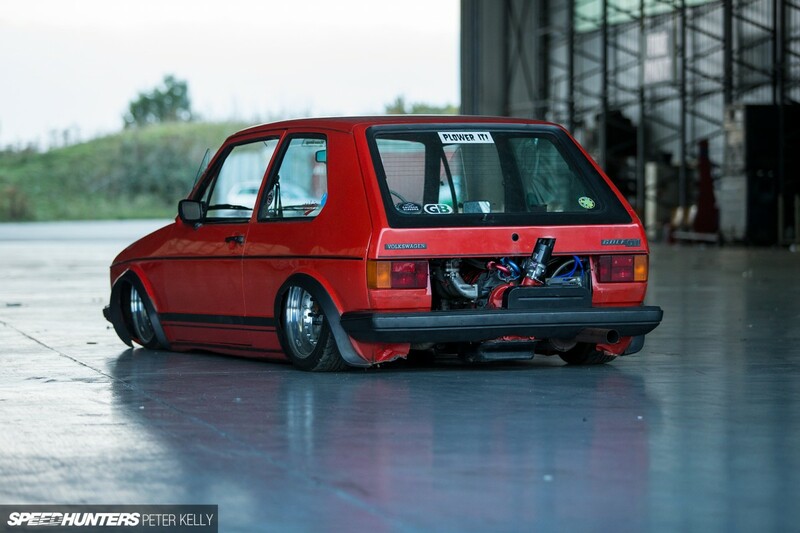 Is it just me, or does this golf really look desperately sad? Spaghetti Amen. I enjoyed the look at first, but I'm sick of it now. the only thing im puzzled about is what he likes about the golf,its such a ugly little box,t think its a waste of a great chassis for a vw bug why a golf?they are not worth anything,if you build a bug it will be worth it as an investment,but this is a complete waste of money.which i am guessing he has plenty of.